“A governor and his sordid past are at the heart of a tale of retribution in Amaru’s stunning debut novel. When Karen Lafitte disappears, her father, Louisiana governor Randy Lafitte, is initially skeptical of the ensuing ransom note. The governor believes that he’s responsible for his father’s death years earlier, resulting in a curse that’s been passed down the Lafitte line. He’s particularly concerned that his daughter is now the same age as his son, Kristopher, who was 18 when he was killed. In fact, in addition to money, the ransom note demands the pardon of a lifer, Lincoln Baker, who was imprisoned for the murderer of Randy’s son. What follows is an elaborate pattern of revenge involving multiple parties, delving into the Lafitte family history and Randy’s dark road to an elected office. Amaru’s greatest achievement is a nonlinear story that still manages to be clean-cut and precise. The plot bounces readers from one time period to another–flashbacks sometimes occur during other flashbacks, and dream sequences meld into memories and back into real time. Despite this narrative style, the story is, surprisingly, never perplexing. 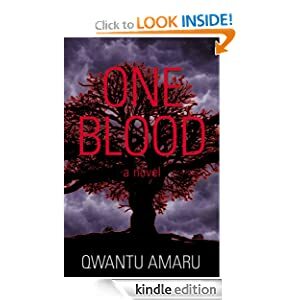 One Blood is an excellent discourse of interwoven tales. The story is engaging and as it unfolded, each of the characters came to life in their own way. The cast was well written and none of them shone more brightly than any of the others. In a book with a huge cast of characters, you sometimes find that one or more of them are written with more depth, either by design or accident. In One Blood, each character plays an integral role and as a result, are all believable, and even more importantly, could exist in the society that we inhabit today. The prose that Amaru uses throughout is fluid and quite lovely at times, while in others they hold the edge that they need to. It’s a tool that helps the interwoven plot to move smoothly. If I were to offer a criticism, it would be this – as the interwoven story unfolds, there is a necessity for each story to be told at a certain pace. There were times, while reading, where all I wanted was the chance to read more than a snippet of certain stories. The brief glimpses are a necessary evil when creating tension and mystery, but there were times I found it distracting. I wanted to know so much more of a particular story that I found I had to slow down and read what was in front of me, otherwise I would miss something important. And that’s not a bad thing in any way, since it only serves to keep the reader engaged and waiting for the next piece. If you’re interested in picking up One Blood, you can find it on Amazon here. 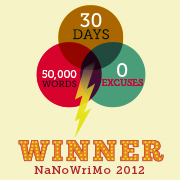 This is a Flash Fiction challenge. Your story must be a minimum of 100 words, maximum of 200 words. Incorporate each of the three prompts into your story. Post your story into the comments of this post. Include your word count (or be excluded from judging). Please include your Twitter handle or email. The contest opens at 7 A.M. and closes at 8 P.M. Eastern Time. Generally speaking, the winner will be revealed Tuesday evening, huzzah! There is the undisputed CHAMP. Rather self explanatory. There is the JUDGE’S PET, for best use of the Judge’s prompt. Last but not least, the JUDGE gets a badge, because Judges need love, too. So what were the prompts you might ask? In the end, I had to judge all of the submissions, which was loads of fun! If you’re interested in reading the submissions, you can find them here in the comments section. If you’re interested in learning who I choose as winners in each of the categories, you can find that information here. And in case you’re interested in taking part, #MenageMonday happens just about every Monday! The roots of evil run deeper than you can ever imagine. Lucas Sawyer and his wife Tamsen find themselves marooned in the heart of a mid-nineteenth century wilderness forest. They are rescued by Jonah Duvall, a mysterious woodsman abiding in this strange valley with his wife Jezebel and their son Cord. Brooding over all stands the Devil Tree – a huge evil jackpine that has summoned them to this valley to feed upon their collective emotions and their unnatural offspring. Part earth spirit, part elder demon – the tree is farming them. The characters are bound in a tightening noose of undeniable fate. As winter sets in they must face the tree’s unholy fury in an utterly horrific finale. Devil Tree is a story that will take you further into the heart of unimaginable horror. In the beginning of the book, I found the language, descriptions and characters to be a little bit tedious. I can remember looking down at my Kindle, seeing that I was only about 15% in and wondering how I was going to get through to the end… I persevered however, and was glad that I did. As I past the point where normally I would have put down a book, Vernon’s descriptions became fluid and expansive; the dark fantasy involved was fantastic – he just gives you enough to paint the picture once you close your eyes. I found the characters to be written with that edge of believability that draws them just a little bit closer into your world. With Duvall, you’re not sure if you’re meant to like him or loathe him. It’s an odd reaction at times, he was helpful but within the vein of malevolence. Lucas was such a torn character; alternating between his inner demons and his reactions to the situation he has been thrust into. His inner turmoil was echoed in the arching turmoil of the entire story. 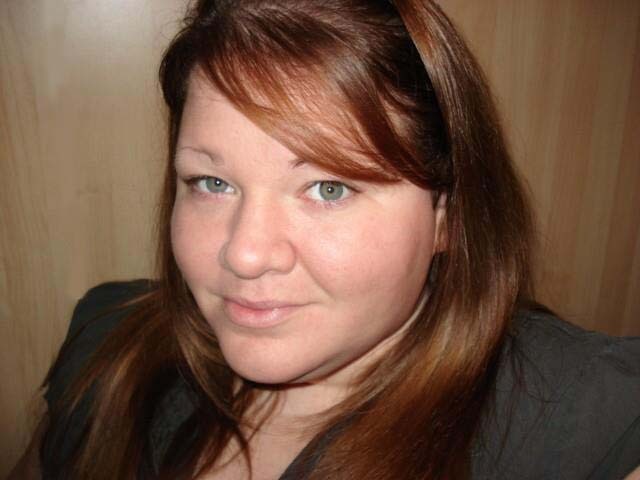 On the other hand, Tamsen was such an enigma – her disconnect from just about everything that was going on around her was delightful in its vacancy. And yet, in the end, you came away knowing more about Tamsen than what you initially got from the words written about her. Jezebel might just have been my favourite character of all – I just loved the roughness with which Vernon chose to describe her. As a character, Cord was the epitome of innocence and of innocence being corrupted. As a cast, they covered all of the main archetypes in horror and then some. The parts are complete when you add in the evil Jack Pine itself. 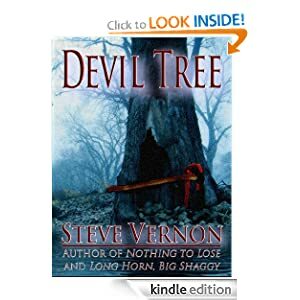 There’s a reason why it’s titled Devil Tree. The only criticism that I can offer is that the story took too long in the beginning to grab me. Part of that has to do with the fact that, to me, the prose felt somewhat disjointed in those first pages. While I can see the benefit of the disjointed prose in the beginning given the subject matter and scenes that were taking place, it was distracting. In summation, Devil Tree is a dark and edgy book. While I had a hard time getting into it, by the end, I was glad that I stuck with it. At times, it was beautiful while at others it was filled with such vividly horrific moments that I wished I could turn my eyes away. 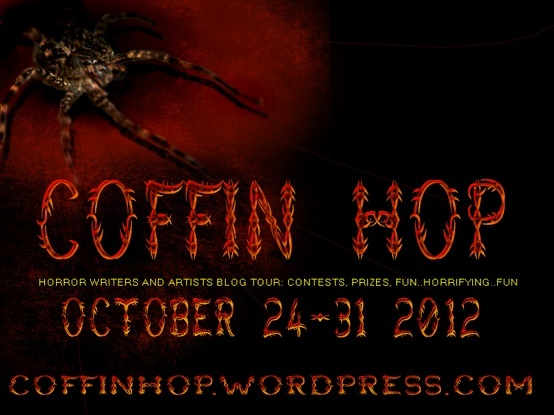 Days with the Undead Blog Tour – Flash Fiction – Found: An Interview with Julie! For those of you that have been wondering what I’ve been doing for the past five weeks, I’ve been promoting my novel Days with the Undead: Book One on a whirlwind blog tour that has me stopping at blogs all over the place! It’s been a lot of fun and I’ve written on quite a lot of different subjects from Zombies and other supernatural creatures to discussions on writing. I’ve also done a fair number of interviews. If you’re interested in checking out the other stops on the tour, you can find links here. Don’t forget to read this post first though! I’ve been watching the news like everyone else these days and I have to say that I’m completely riveted. I probably shouldn’t be; I’m only fourteen and I live in one of the worst neighbourhoods of Los Angeles. I should be watching for any sign that gang violence is about to erupt, and continuing to avoid the guys on the street corner trying to sell me drugs. Instead, I’m glued to my laptop screen watching the images coming out of some place called Toronto. It’s in Canada, I looked it up. A riot or something is happening up there. The weird thing is that people aren’t dying when they’re shot. I’ve been reading stuff on the ‘net too. Some are saying the rioters are dead, but that can’t be possible; they’re still walking around. I asked my dad the other night while he was still sober what he thought was going on. He just told me to stop being so nosey. I don’t see it as being nosey, frankly. I view it as taking an interest in current affairs. I want to be a journalist when I grow up, so I need to take a keen interest in what is going on in the world around me. I even have the best name for journalism; Gloria Gonzales. It has a nice cadence, doesn’t it? Today I start my career as a serious journalist. I might not be the best yet, but I only plan on getting better. I have a feeling that something is going on up in Canada and while I can’t get there, I can take a look from here and see if I can’t help figure some of the confusing bits out for everyone. Not only have I scored an exclusive Skype interview with someone fleeing this riot, she actually has an idea about what is really going on! Without further ado, I give you my interview with Julie Odette, a resident of Toronto and witness to the situation that’s unfolding there. GG: Welcome Julie! Thank you for agreeing to talk to me today. JO: Gloria, thank you for giving me this unprecedented opportunity. GG: Can you tell me what exactly is going on in Toronto? JO: At the moment, I don’t know much about what is currently going on but I think it’s safe to assume the city is lost. However, I can tell you what happened eight days ago, if you like. GG: Yes, please do. The public has been trying to get a grip on why the riot started in the first place but with no information coming out of the city, it’s been very difficult. JO: Eight days ago, a situation arose that I cannot fully explain. A man was brought into the Emergency Room of St. Michael’s Hospital with very weak vital signs. That man passed away and then came back to life. Only it wasn’t life that returned to him. Within minutes, the Emergency Room was in utter pandemonium and the infection was spreading. GG: Infection? So it’s something communicable then? JO: In a manner of speaking, yes. I’m not quite sure how to break the news to the rest of the world so I’m just going to say it. That man was dead and when he woke up, he was still clinically dead. Whatever infection he had been exposed to allowed his body to reanimate and caused him to wreak havoc throughout the Emergency Room, spreading the infection. This may be hard for you to hear but what we are dealing with is a full scale Zombie infestation. JO: I’m completely serious Gloria. I examined some of them myself while they were under full restraint at the Centre for Forensic Sciences where I work – I meant where I worked. I know that it’s hard to believe but trust that what I’m telling you is true. My friends and I have been fleeing from them for the past eight days. Hell, we barely made it out of Canada alive. GG: I don’t understand. Is this some sort of hoax? JO: Gloria, listen to me carefully. This is not a hoax. I swear. The public needs to be made aware that Zombies are walking the earth at this very moment and there is no one out there in any position to stop them. They are going keep spreading, that’s their nature and as they catch more and more living people off guard, their ranks are just going to explode exponentially. Don’t get me wrong, there’s still time to focus and prepare yourselves. JO: The first thing you need to do is get out of the big city. High populations are just a higher food source for them and the last thing that you want to do is get stuck in the city with hordes of them roaming the streets. The most important thing is to head in the direction opposite to where they are. You’re close to Mexico; I suggest heading there first and then keep on going. Don’t stop once you think you’ve gotten far enough away. If no one stops them, they will find you eventually. GG: If nowhere is truly safe, what is the point in running? As you can see from the video, we lost our Skype connection to Julie there. I don’t know why and I hope that it wasn’t something bad. Can you believe what she said about the Zombies? Can it possibly be true? Maybe she will be able to call back and continue to fill us in. In the meantime, I suggest that we all keep our eyes on the news in the hope that someone will be able to tell us what is going on.